Example of the rainfall potential product for the three hours beginning 15:00 UTC on July 8, 2005, derived from rain rates based on SEVIRI data. 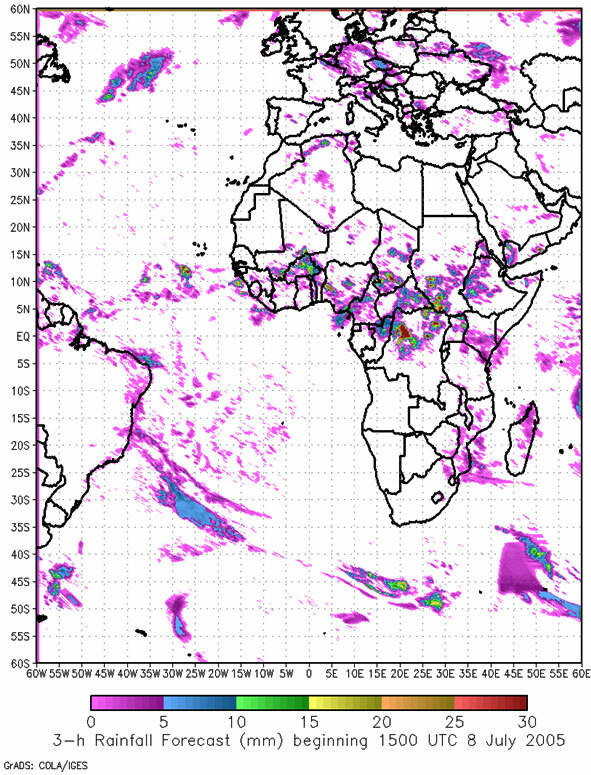 The rainfall potential algorithm derives a prediction of rainfall accumulation at each ABI pixel during the 0-3 hour timeframe. The algorithm predicts future rainfall rates based on extrapolation from current and previous ABI rainfall rates where these instantaneous rates are accumulated into total predicted rainfall during the next 3 hours. The rainfall potential product will provide guidance to forecasters in their preparations of heavy rain and flood related warnings.